THE situation at the Nehale lyaMpingana railway station at Ondangwa is currently out of control after hundreds of job seekers yesterday stormed the TransNamib premises and confiscated the paper containing the names of the 40 successful applicants. This follows allegations that most of the successful applicants were recruited fraudulently without even going through the physical fitness test, while those who went through the tough test were sidelined. A source at the scene revealed that the security guards, however, managed to recover the name list, although the situation remains tense. Oshana Regional police commander Commissioner Rauha Amwele on Wednesday said that she was dispatching a police contingent to the scene to monitor the situation and take the necessary steps to maintain law and order. TransNamib wanted to recruit only 40 general workers to do maintenance work on the railway line for six months. The only requirements were that a prospective employee must be in possession of a Grade 10 certificate and physically fit to do manual labour. Between 2,000 and 3,000 prospective employees turned up on Tuesday morning and turned the Nehale lyaMpingana Railway Station into a chaotic scene. 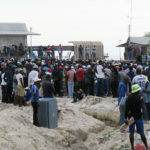 One of those trying their luck at getting employment, Jesaja Nambudunga, said that a fairly big number of people were already at the scene when he arrived there at around 02:00 and by sunrise the number had swelled to over 2,000 souls. TransNamib officials started collecting CVs and other personal documents at around 08:00 after which they started calling candidates for a physical fitness test which includes carrying heavy loads over a distance. Martin blamed the government for dumping many youths in the streets with its current academic system that does not empower the youth through skills development and does not provide sufficient funding for those who want to further their studies. 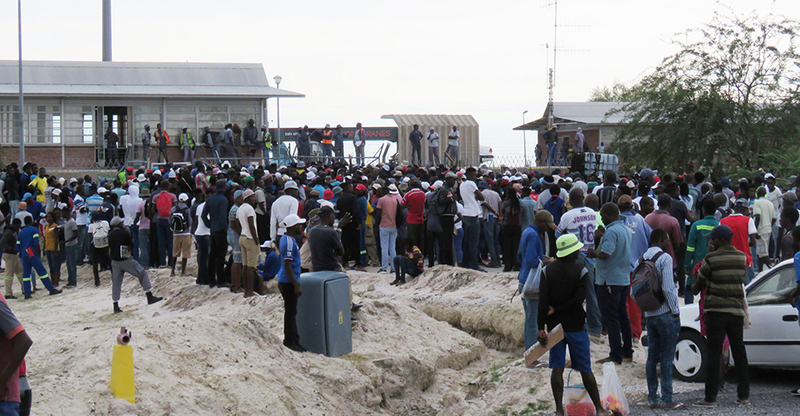 A big crowd of unemployed youths gathered at the Nehale lyaMpingana Railway station at Ondangwa for the second consecutive day on Wednesday, each one hoping to get one of the 40 employment opportunities on offer, but a TransNamib official who picked up the phone but refused to identify himself said that the recruitment process was completed already on Tuesday.